Floor Protectors Prevent Damage Normally Caused By Moving Furniture. Transparent, Flexible Sleeve Securely Conforms To The Size And Shape Of Chair Or Table Legs, Eliminating The Need For Adhesive. The Cushioned Felt Tip Lasts Longer Than Standard Felt Pads, Dampens Noise And Distributes Weight Evenly For Better Furniture Wear. They Are Perfect For Restaurants, Hotels And Areas Where Esthetics Are Essential. One Design Fits Multiple Shapes And Sizes. Clear Sleeve Floor Protectors Are Recommended For All Hard Floor Surfaces And Fit 1-1/2" To 1-5/8" Round Legs Or 1-3/16 To 1-1/4" Square Legs.. Floor Protectors Prevent Damage Normally Caused By Moving Furniture. Transparent, Flexible Sleeve Securely Conforms To The Size And Shape Of Chair Or Table Legs, Eliminating The Need For Adhesive. The Cushioned Felt Tip Lasts Longer Than Standard Felt Pads, Dampens Noise And Distributes Weight Evenly For Better Furniture Wear. They Are Perfect For Restaurants, Hotels And Areas Where Esthetics Are Essential. One Design Fits Multiple Shapes And Sizes. 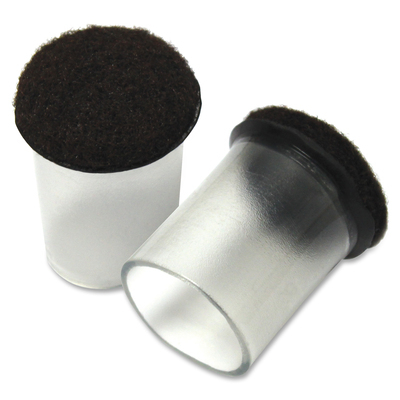 Clear Sleeve Floor Protectors Are Recommended For All Hard Floor Surfaces And Fit 1-1/2" To 1-5/8" Round Legs Or 1-3/16 To 1-1/4" Square Legs.